Last week I posted two of my favorite projects from Pinterest that I plan on doing this spring, and thought it would be fun to add a few more this week. Enjoy and I hope these posts get your creative juices going! I love commemorating memories in a crafty way, and I found a perfect way to do this and have it outdoors. Plus, it is is a great way of using up all the scrap pieces of wood from my husband’s projects that are always laying around…lol. All these wood scraps have turned into an enjoyment of using them is all kind of craft projects, and I love this idea. 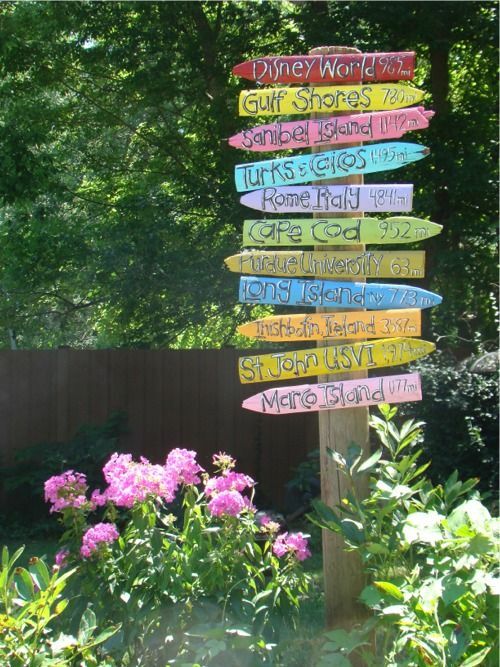 As you can see in this picture, make small signs of all the places you have travelled! You can slowly build and add to it as you go places. Let your imagination fly as you create each sign – part of the charm is that they are not all the same color. And on the one I am going to make I’ll mix up the fonts as well. One hint as this will be outdoors – after you are done with the painting of each sign and it has dries, heavily coat it with a clear acrylic sealer. I use the kind you get in a spray can. I love garden art, and this year I want to make a few pieces to put in mine. I’ve been gathering ideas, and I love the one pictured below. I found this on a website, but thought this could easily be made. Just find a narrow stake, some thin and pliable wire (I plan on using baling wire to see how that will work), and of course beads. You could use a color theme, or mix and match as is pictured. Use large, flat ones to seal off the top and you will need something to use for a “plug” . I have a short, hollow piece of metal I am going to use and then once all the wires are inserted will seal it off with Gorilla Glue or use my hot glue gun. 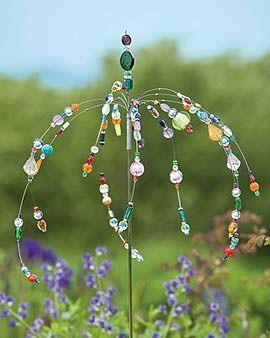 Imagine watching the colorful beads dance in the breeze and capture the sunshine!